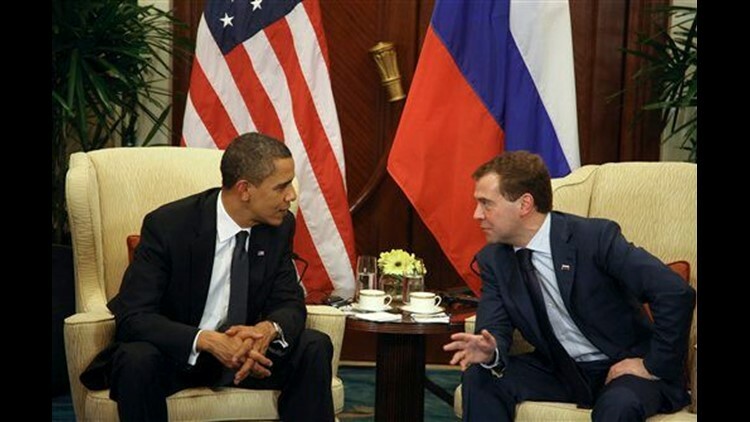 WASHINGTON (AP) — President Barack Obama and Russian President Dmitry Medvedev agreed on Friday to reduce the arsenals of the world's two largest nuclear powers — the first major arms accord in a generation. Final agreement came in a phone call between the two and a flurry of announcements in Washington and Moscow. "This landmark agreement advances the security of both nations, and reaffirms American and Russian leadership on behalf of nuclear security and global nonproliferation," a White House statement said. The new treaty — designed to replace the 1991 START accord which expired last December — would further shrink the massive stockpiles the United States and Russia amassed during the Cold War. It would limit both sides to 1,550 warheads — about 30 percent fewer than are currently allowed — and 700 deployed missiles and bombers. In addition, the White House statement said, the measure includes tough verification measures that'll enable both sides to monitor all aspects of its implementation. Though the agreement must still be ratified by the Senate and the Russian Duma before it takes effect, Obama and Medvedev plan to sign it next month in Prague — the city where last April, Obama delivered his signature speech on arms control committing America to the ultimate goal of "a world without nuclear weapons." "The presidents agreed that the new treaty demonstrates the continuing commitment of the United States and Russia — the world's two largest nuclear powers — to reduce their nuclear arsenals consistent with their obligations under the Nuclear Non-Proliferation Treaty," the statement said.